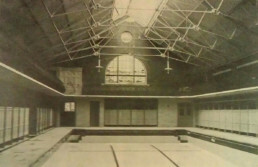 Built on the site of a foundry, Bramley Baths first opened as a pool and public bath-house in 1904, enabling local residents to wash, swim and use the new Russian Steam Baths – fashionable with the Edwardians as a healthy past-time. Much care has been taken to preserve the original character of the building, most noticeably evidenced by its landmark chimney, the poolside changing cubicles, the stained glass and the original oak ticket desk at the Baths’ entrance. 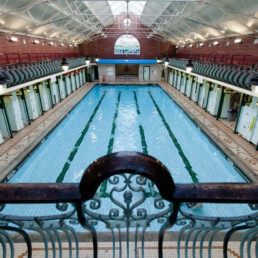 Bramley Baths houses a public gym, swimming pool, steam room and space for community events, meetings and fitness classes. 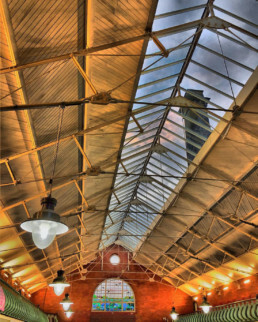 The foundry chimney built with 8000 Kirkstall bricks, still towers over the baths and can be seen from across Leeds. The building is owned by Leeds City Council, and has been managed by Bramley Baths & Community Ltd on a 25 year lease since 2013. It receives no subsidy and makes a small surplus each year. The aim is to successfully run the Baths for the benefit of the local community and to ensure that the building is properly maintained so that people can swim here for generations to come.